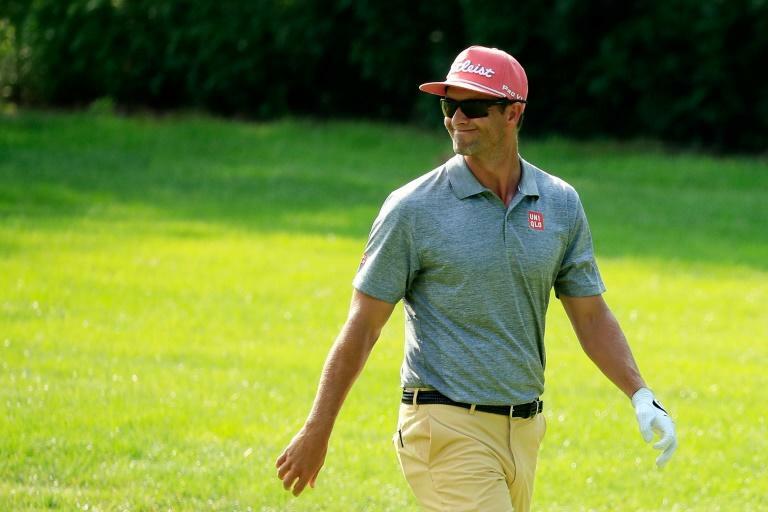 Adam Scott defended his controversial long putter on Friday after a sizzling seven-under-par 64 left him firmly in contention at the Northern Trust in New Jersey. The Australian veteran recorded just 26 putts after using his trademark long-handled putter to reel off eight birdies against one bogey at a rain-softened Ridgewood Country Club. Scott, 38, has come in for criticism this season with one fellow professional claiming that his putting style was illegal because it broke rules outlawing "anchoring". A ban on anchoring was introduced in 2016 and forbids players using long putters from "anchoring" the club against their body from a fixed point. Scott on Friday denied he had broken any rules. "Well, it's not anchoring. It's not," Scott replied when asked about social media criticism he has faced this year. "I'm not really on social media. I don't really see it. The way it is, there's a lot of stuff you could comment about the Rules of Golf about how is this and not that and how is this and how other people do things. "They seem to have created a lot of gray areas that certainly I'd be careful of accusing people of breaking the rules." Scott's round on Friday left him in third place on nine-under, just one shot behind the American leading duo of triple Major-winning Brooks Koepka (65) and Jamie Lovemark (66). Scott meanwhile joked that his decision to add a small putter into his golf bag had sparked his favoured long putter into form. "The presence of the small putter in my bag has clearly scared the longer one into action," he said. Scott's superb round came after a third place finish at the PGA Championship in St. Louis earlier this month, the Australian's best finish in a Major since sharing fourth in the 2015 US Open. "I am very comfortable being back in contention," he said. "I was partially surprised how good I felt Sunday of the PGA, especially late on the back nine because I haven't been there for awhile, and you're never sure, but it was really great. It felt like that's where I'm meant to be and I played really well in that situation I thought. "So, that certainly gave me a taste of it, and made me a little more hungry. It's been good to play my way into it for the weekend. Tomorrow is another big day and I'd like to have another taste of it on Sunday."